Sonic fan site Blue Blur has posted some scans and relayed a good bit of information regarding Nintendo Power’s cover story of Sonic and the Black Knight in their September 2008 issue. Nintendo Power quote: ”This time, a sorceress named Merlina summons Sonic to the mythical realm of King Arthur, but it seems the fabled monarch has somehow been corrupted and now rules the land as the tyrannical Black Knight.” It appears the ultimate enemy here is King Arthur as the Black Knight. Yes, there will be swordplay. Advanced techniques include the ability to thrust, parry, and do a buzz-saw maneuver midjump. The sword has a name, Calibur. Sonic won’t be controlled via the Wiimote that we’re aware. The “control stick” (Nunchuk? D-pad?) will handle Sonic. There will be some more RPG elements in this. 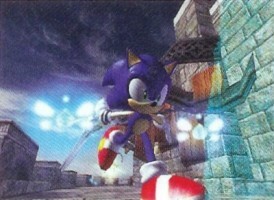 Blue Blur quote: “If you help civilian townfolk in need of assistance, you’ll earn points toward knighthood. If you smite one of those civilians, your reputation will take a hit.” The game will tally these elements together at the end of each stage to give you a rank. You’ll also be able to purchase and equip items from stage residents to aid in battle. In all, there will be 200 items. ONLINE COMPONENT: You’ll be able to trade items in the game with friends online. Rings…in burlap sacks. Maybe it will be used as currency? Element of magic used for special moves, such as a speed boost or an extra jump. SKILL AND MISSION SYSTEM RETURNS. Development team hopes to make it less intrusive. PLAYABLE CHARACTERS: Knuckles and Shadow confirmed playable characters, though dev team says this will be optional. We’ll have more as we get it.